Well, this week hasn't been a massive progression kinda week....but it has been a satisfying week! I haven't done a great deal on the shawl, and actually it grows incredibly quickly, so I must have committed very little time. 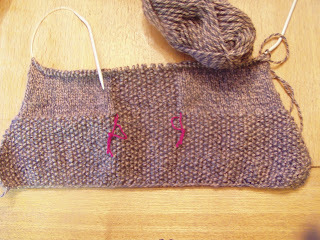 The pattern is very pretty already, but will look so much better when it is blocked. This is what has taken my attention away from the shawl. The pattern is called Terra , a hooded sweater, and it has been a good learning opportunity for me. Shortly after starting I got into a huge mess where I dropped a stitch, tried to correct it and made an even bigger mess............so after a lot of huffing and puffing and a little deliberation, I decided to start again fully, but this time went the whole hog and taught myself continental knitting, this meant a lot less hassle and quicker progress.....I am still on a steep learning curve but I'm enjoying the climb! I also learnt a new method of casting on......so check me out! Anyway, enough about me....how about you? How are you progressing? To check out other people's Year of Projects work see the ravelry group page. As always, thanks in advance for all your support.....any advise greatly appreciated, my woes are only just beginning with my new sweater as it is a much bigger project than I've attempted before and looking at others details on their Terra jumpers, the outcomes are not always consistent! 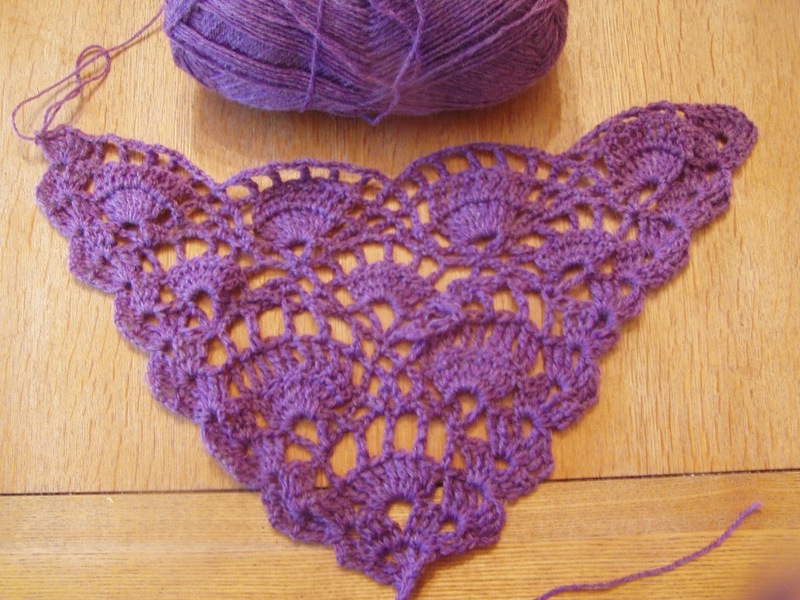 Your shawl is going to be so pretty, what yarn are you using for it that shade of purple is lovely ? I like the Terra and well done you on learning both continental knitting and a new cast on method, take it step by step and you'll do perfect, your already flying. Your shawl looks amazing, so much delicate detail it will be stunning when it's all finished. That festival shawl has been in my library on Ravelry for ages, it looks amazing in the purple. I've been looking at the continental knitting style as it seems quite popular with crochet fiends. Maybe I'll have a little try later this week. Did you find any particularly useful information or videos? LOVE that shawl- and it's very impressive that you're knitting and have taught yourself so much as well!!!! Looking forward to seeing the progression on both, as they will both be beautiful!! You have made wonderful progress on you jumper. I love your stitch markers, I always use coloured wool where I meant to have proper stitch markers!!. Go you! You won't be able to use that "I'm not much of a knitter" line any more, especially now that you've learned continental knitting! Both projects are gorgeous. Oh dear, we've all been there I think! So many of my attempts to fix just end up a mess :( I'm always much happier when I go back and do it again. The shawl pattern is very pretty! It's so neat how your purple shawl is coming out! Good for you on learning a new technique. How does Continental help you better with this hooded project? I learned Continental at my first knitting class but I teach English to new knitters as it's easier. SUCH a beautiful pattern and colour on the shawl. I can't seem to see the sweater photo - but it looks great on the Ravelry page. I like the moss stitch. That shawl is stunning! And way to go you learning some new techniques---I don't even know what continental knitting is. With my mystery KAL in January we learned a twisted German cast on, and at first it looked intimidating,but after watching a video several times, it became easy and I felt so accomplished, even though now I am stressing over picking up some stitches for a thumb! I am sure you feel accomplished too, and I applaud your choice to tackle a larger object! Amazing to have two big projects going at one time; that alone has me in awe! The purple, though, is going to be just GORGEOUS! Can't wait to see it done! Seems like you will be getting your own pretty hoody! Good luck with this project, can't wait to see the result. I don't really know teawagon tales, I googled it and found this wonderful blog. I think you mean this blog, since it is so cute! I started following it, thanks for pointing it out! Oooh I am also loving the purple shawl. That is going to be stunning.